Item 2: The approval of the Annual Individual Financial Statements as at and for the date ended on December 31, 2018, prepared in compliance with the Order of the Ministry of Public Finances no. 2844/2016 for the approval of the accounting regulations compliant with the International Financial Reporting Standards, based on the 2018 Annual Report of the Administrators and the report of the independent Auditor on the annual individual financial statements as at and for the period ended on December 31, 2018. Item 3: The approval of the Annual Consolidated Financial Statements as at and for the date ended on December 31, 2018 prepared in compliance with the Order of the Ministry of Public Finances no. 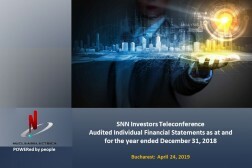 2844/2016 for the approval of the accounting regulations compliant with the International Financial Reporting Standards, based on the 2018 Annual Report of the Administrators and the report of the independent Auditor on the annual consolidated financial statements as at and for the period ended on December 31, 2018. Item 4: The approval of the Annual Report of the Administrators for the financial year ended on December 31, 2018, in compliance with the provisions of art. 63 of the Law no. 24/2017 regarding issuers of financial instruments and market operations and those of the Annex 15 to Regulation no.5/2018. Item 5: The approval of the proposal of the Board of Directors regarding the distribution of the net profit for the financial year 2018, of the total value of the gross dividends in amount of 378.914.310 lei, of the gross dividend value per share in amount of 1,25670615 lei, of the payment date, namely June 28, 2019 and of the methods of payment, as provided in the Note presented to the shareholders. Item 5¹: The approval to distribute the amount of 438.625.752 lei as supplementary dividends, respectively the value of the gross supplementary dividend per share in amount 1,45474494 lei. 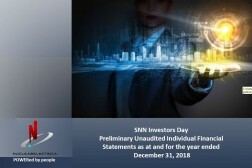 The supplementary dividends due to the shareholders will be paid on the same date, namely June 28, 2019 and under the same methods of payment as the dividends related to the net profit of the financial year 2018. Item 6: The approval of the discharge of duty of the members of the Board of Directors for the financial year 2018. Item 7: Approval of the sale of the asset “Flat building LOT 2+LOT 1 (singles’ dormitory)”, consisting of the building, the related land, the connection to the heating network, parking facilities, sports field, green spaces, located in 14 Salciei Street, Cernavoda city, Constanta County, belonging to the Nuclearelectrica S.A. National Company.